Fancy a holiday that’s got everything going for it? If you’re after plenty of sun, sea and sand in a relaxed and friendly environment, pay a visit to sandos.com and check out their amazing selection of hotels and resorts on both sides of the Atlantic. From luxury all-inclusive hotels in Spain to sprawling beach resorts in Mexico, booking with a Sandos hotels and Resorts voucher can get you your dream holiday for less. We all know what it’s like when booking a holiday – you want to get out there and discover new and exciting destinations, but you also want to be able to rely on quality accommodation and good customer service – which can be difficult in a foreign land. Luckily, Sandos Hotels and Resorts are there to help. With a selection of 7 properties in some of the world’s favourite holiday destinations, they can help you plan your dream holiday – and with Sandos voucher codes it doesn’t need to cost a fortune. 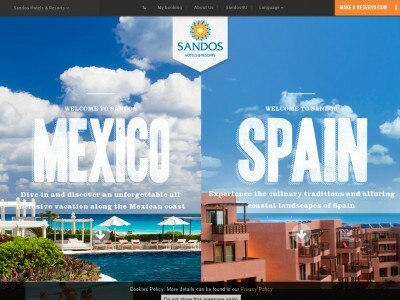 At sandos.com you’ll find their properties split into two sections: hotels and resorts in Mexico, and hotels and resorts in Spain. So whether you’re looking for an exotic adventure across the Atlantic or something a little closer to home, there’s something to suit every budget and taste. And don’t forget that with a Sandos Hotels and Resorts discount code you can make big savings too! The company strives to offer its guests the very best whether they’re staying for two weeks or just a few nights. They are dedicated to providing excellent quality accommodation, and a customer service that’s second to none. And don’t just take our word for it! They’ve won several recognitions over the years, including eco-tourism accolades and inclusion in several definitive accommodation guides. Just log on to sandos.com to find out more. Travellers can take their pick from 7 Sandos Hotels and resorts, from the beautiful Sandos Caracol eco resort offering low impact holidays on the Caribbean coast of Mexico to the Sandos Monoca hotel and spa with indulgent health and beauty facilities in the lively Spanish resort of Benidorm. And if you enjoy holidaying with Sandos, you can collect reward points through their Sandos4U scheme – meaning the more you holiday, the more affordable at will become! Want to get booking today? All you need to do to get started is log on to sandos.com – and don’t forget to pick up your Sandos voucher on the way! Browse our website until you find the Sandos Hotels and Resorts coupon that’s right for you, then log on to sandos.com to begin searching. Enter your Sandos Hotels and Resorts voucher in the box provided and click ‘Search room’. Dreaming of the perfect holiday relaxing with some sun, sea and sand? Make your dream a reality with a Sandos Hotels and Resorts discount code. Want to find out more about incredible holidays with Sandos Hotels and Resorts voucher? Why not pay a visit to their dedicated YouTube channel here? You’ll find lots of exclusive content including video resort guides, travel tips, wedding planning guides and much more. You can also use this channel to find out more about saving money with Sandos Hotels and Resorts voucher codes. If you’ve enjoyed shopping for hotels with Sandos Hotels and Resorts, why not check out more great deals on accommodation around the world with stores like Booking.com or lastminute.com. Or, if those aren’t up your street, you’ll find plenty more deals to browse in our Travel section. Log on to sandos.com to begin searching. Enter your Sandos Hotels and Resorts coupon in the box provided and click ‘Search room’. Choose a holiday and click ‘Add’. Enter your payment details and click ‘Confirm your booking’. Don’t forget to use your Sandos Hotels and Resorts vouchers at the checkout! Need some help and support using sandos.com? Whether you want to advice on choosing the right holiday for you or you need some assistance in using your Sandos Hotels and Resorts voucher, the friendly and experienced team of staff will be only too happy to help. You can contact them by accessing the online Customer Services area here. Want to learn more about relaxing holidays with Sandos Hotels and Resorts voucher? Why not follow them across your favourite social media networks? You’ll find lots of great content including hints and tips on what to do in the area, travel inspiration, special offers and promotions and much more. Each hotel operates their own social media profile – to access sites for individual hotels see the links at the bottom of their homepage here. Of course, we know that people who love holidays are always on the go. That means that no great hotel booking site is complete without the option to view it on your mobile device too. Luckily, sandos.com has been optimised for your smartphone or tablet - just visit the link here to get browsing. You can search for hotels, make reservations and start planning your trip, all at the touch of a button. You can even use Sandos Hotels and Resorts voucher codes from your device! Sandos Hotels and Resorts always strive to offer excellent value for money, so that everyone can afford to enjoy the holiday of their dreams. That’s why, in addition to their regular low prices, they also run plenty of offers and deals to help your money go even further. For example, right now you can book holidays to Spain or Mexico for summer 2016 and enjoy up to an amazing 44% off! And don’t forget to add your Sandos Hotels and Resorts discount code to make even bigger savings! Love to while away your days dreaming about holidays on far-off white sand beaches? Why not let the Sandos newsletter lend you a helping hand? Packed full of all the latest news from their hotels around the world, plus special offers, travel tips and much more, it’s a great way to get your regular travel fix delivered straight to your inbox. All you need to do is visit sandos.com and enter your email address – and that’s it. You’ll even get the latest Sandos Hotels and Resorts voucher included to – so you don’t need to worry about missing out on the best deals. Buy now online at www.sandos.com. I’d always wanted to enjoy an all-inclusive holiday to Mexico, but I never thought I’d be able to afford the cost. Then I discovered a Sandos Hotels and Resorts voucher online. I just visited sandos.com and took my pick from 4 beautiful resorts and hotels scattered around the country. We finally decided on an eco resort on the Caribbean coast, and really did enjoy the holiday of our dreams. And it was all thanks to Sandos Hotels and Resorts voucher codes!